Video: White Sox broadcaster Jason Benetti previews the coming season. It might be cold and snowy outside, but on Wednesday, pitchers and catchers report for their first spring training workouts. The Cubs and White Sox are preparing to hit the field in Arizona: the Cubs in Mesa, and the Sox in Glendale. 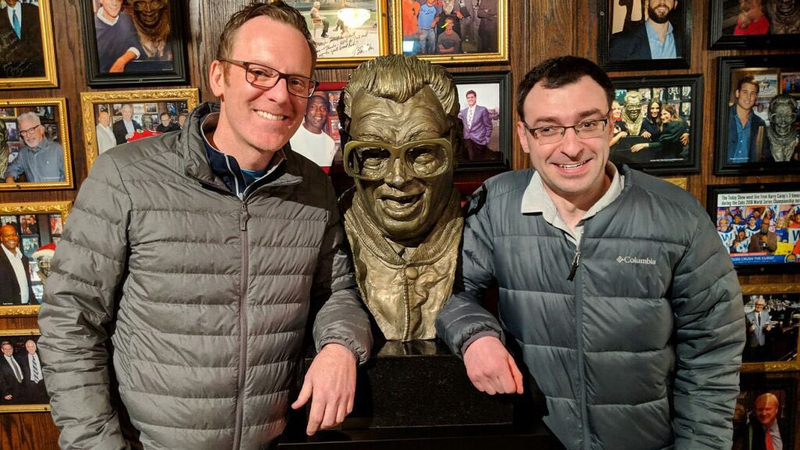 We asked White Sox broadcaster Jason Benetti and Cubs broadcaster Len Kasper about the upcoming season. These interviews, conducted separately via email, have been edited for clarity. Chicago Tonight: Jason, the top question on the mind of White Sox fans seems to be: Is Manny Machado coming? And why is it taking him so long to make a decision one way or another? Jason Benetti: I think there are a lot of factors at play here. One is that, seemingly, the two big-name free agents (Bryce Harper and Machado) don’t want to move first. They’d prefer that the other sign first in order to set the market, giving the other the opportunity to surpass it. Also, free agency in general is surging later and later each of the past few offseasons, so Machado and Harper are just part of the system. CT: Jason, what do you make of the Sox “friends and family plan” to woo Machado? JB: I assume you’re talking about Yonder Alonso and Jon Jay. (Note: This offseason the White Sox acquired Alonso, Machado’s brother-in-law, and Jay, Machado’s close friend.) Seems like they happen to be two guys who provide things the Sox had gaps in (left-handed power and a veteran in the outfield). CT: If the Sox come up empty on Machado and Harper, especially after this long waiting period, how do you expect Sox fans to react? What would be your reaction? JB: As Rick Hahn said at SoxFest, even he would be disappointed. So, I think Sox fans would be disappointed. I would be too. But, disappointment doesn’t cancel a rebuild. And neither does not getting one of those players. CT: Len, do you think there is any chance the Cubs are still in the running to sign Bryce Harper? A surprise signing of Machado? Len Kasper: In this business, you never say never, but I would say it’s highly improbable that the Cubs make another significant move before the start of the season. CT: What’s the deal with the free agent market in general? What do you make of “collusion” charges? Or are star players now thought of differently given the analytics we now have? LK: Most (all?) presidents/GMs today are analytics-driven, and the data doesn’t lie. You typically get the most production out of players in their 20s at reasonable and often bargain rates. Then you have to (sometimes wildly) overpay players once they become free agents. It’s just generally not smart business. My guess is in the next CBA (collective bargaining agreement), the union will do all it can to change the paradigm a bit and get younger players more money early in their careers when they are still considered “high upside” guys as opposed to later when they may not get the payday they had previously expected. JB: Every team has so much more information than they used to. Collusion, to me, is a strong word that requires substantial evidence of affirmative collective acts by owners. Concerted action. Independent like-mindedness isn’t enough to prove collusion. CT: Jason, how would you assess the progress of the White Sox rebuild? JB: I think the Sox have done what they set out to do – collect a large group of top-line prospects. That now will lead to the development piece. This season, with Eloy Jimenez, Dylan Cease and some others, we’ll have our first opportunity to BEGIN to assess that. CT: Are there more bumps along the way than would normally be expected? I’m talking about what some would call the disappointing progress of Yoan Moncada. Also the injuries to Kopech, Robert, Berger, Adolfo. Has that all set things back? JB: How many bumps would you expect? How much risk generally comes with a rebuild? That’s a tough question to answer, because we don’t get to choose how much of the risk we’ve taken on for anything in life (until it) actually comes to fruition. So, I think that the organization knew that injuries are a part of the risk of a rebuild and assumed they’d happen. You’d rather them not happen to someone like Michael Kopech, who infused such energy into the clubhouse and ballpark, but them’s the breaks. CT: Len, the Cubs have been in the playoffs four years in a row, they won 95 games last year with some top players either hurt or underperforming. Even standing pat, you'd think they should be as good or better than last year, right? Is the fan consternation a bit unfounded? LK: The consternation (for the fans and the team itself) is all about the very quick exit last year. I think everyone acknowledges how good this team is and has been. But merely sneaking into the postseason isn’t enough for anybody right now during this championship window. I expect the Cubs to be a division title contender again in 2019, absolutely. CT: Let’s talk about some players, starting with the Sox. Jason, what’s your assessment of (Sox top prospect) Eloy Jimenez? JB: A star waiting to happen. The blend of the physical gifts he has – plus his drive, plus his intelligence – leads to that conclusion. I’m ecstatic the Sox call him a friend of the program. CT: What role do you think (2018 Minor League Pitcher of the Year) Dylan Cease will play this year for the Sox? JB: From what Rick Hahn said at SoxFest, I’d imagine Dylan is on a similar trajectory to that of Michael Kopech last year. I presume he’ll open the season with Triple-A Charlotte and may end up in the majors – barring a setback – by the end of the year. CT: How long until last year’s first round pick, Nick Madrigal (MLB pipeline’s No. 49 prospect), makes the majors, and where will he play/how would his rise affect the rest of the roster? JB: So much has to shake out until then, it’s difficult to say. He can play multiple infield positions. He was in Single-A last year after just finishing his college career, so I’d imagine he’s going to be longer than Cease in the minors. CT: Do you think Jose Abreu is going to be a White Sox for life? What’s the importance of his leadership to this young ballclub? JB: He shows younger players day to day what it’s like to work hard, respect the game and devote one’s existence to self – and team – improvement. He carries with him a standard for young players to aim for. CT: Jason, what do you see as some potential on-field surprises for the coming season? JB: I think the bullpen will be improved. The Sox went out to get Kelvin Herrera, a bonafide back-of-the-bullpen guy. Jace Fry had a strong first full MLB season and should build on that, among other reasons. CT: Okay Len, let’s talk about the North Side. (Pitcher) Jon Lester had an excellent season last year. But should fans worry about him getting old? LK: Jon has what we call “pitchability” in that he pitches well to scouting reports, is able to command the ball better than most and never gives in. It’s a big reason why the Cubs gave him a six-year contract. You always worry about the health of a mid-30s starter with many miles on his arm, but Jon’s durability has never been questioned. CT: What do you expect from (pitcher) Yu Darvish, coming back from injury last season? LK: It’s one of the biggest questions facing this team. The first thing is he has to be healthy. Until he says he’s 100 percent, I’m not sure we know what he can be this season. So far, the reports have been encouraging, and assuming he gets back to 100-percent health, there is no doubt his stuff is still electric. And then it’s a matter of rekindling the Darvish of old who at times was one of baseball’s most dominant starters. CT: What kind of bounce-back do you expect from Kris Bryant? LK: It’s all about his shoulder. If the shoulder is good, I envision an MVP-type season from Kris. No doubt. CT: Are there any players that might provide a surprise this coming season? LK: I have a feeling Ian Happ is poised for a bust-out year. I love his athleticism, keen eye, power potential and defensive versatility. And he is very coachable too. LK: I’m sure the reaction will be very mixed. I trust Theo and Joe and the infrastructure here to make sure Addison is given every chance to be a big part of this team again. The rest is really up to him. CT: Let’s look at the managers of both squads. Jason, is Rick Renteria the right guy to get the team from point A to point C? JB: Ricky has a ridiculously strong comprehension of what individuals need. He’s psychologically very sharp. He kept the clubhouse extremely positive last year in the shadow of a very difficult season based solely on record. He’s sharp, he’s aware and he is very much a natural leader. CT: And Len, tell us what you think Joe Maddon's relationship with management is, and what's his long-term future is with the Cubs? LK: Joe has a great relationship with the front office and is totally comfortable being in the final year of his contract. I think everyone’s focus is on 2019 and not a day beyond that. CT: Len, obviously the Joe Ricketts controversy has been in the news. Do you think there is any chance this could become a distraction for the team/organization? LK: I have no doubt many players will be asked to comment on it this week as spring training starts, but once it’s addressed, I don’t anticipate it being an issue in the clubhouse whatsoever. CT: Len, this will be your 15th season with the Cubs. Is this the dream job? Any different ambitions? LK: This job has been well beyond my wildest dreams. My ambition is to be here as long as they will have me. I wouldn’t want to be anywhere else! CT: Jason, long-time Sox Broadcaster Ken Harrelson, who worked on a shortened schedule the past few years, has retired. What does it mean to you now that “he gone”? Does anything change with you moving to full-time status? JB: Hawk will always be in my heart and in the hearts of Sox fans. I grew up with Hawk. He’s part of the reason I got into calling games. But, I did most of the schedule last year with Steve (Stone). So, we’re ready to roll. CT: Jason, switching gears, what kind of reaction have you gotten to your “Awkward Moments” web series? (A series of videos “bringing awareness through humor to the awkwardness that surrounds disabilities.”) How did that come about? CT: Finally, you two have gotten to know each other a bit. Tell us about your relationship? JB: Len’s an awesome human. So smart. We talk about quite a few things, most of which aren’t baseball. LK: Jason is one of my favorite people — not just broadcasters — on the planet. He might be the smartest person I know (please don’t tell him I told you that). His on-air work is well beyond his years, and I think he can go as far as he wants in this business. Hopefully he wants to stay in Chicago with the White Sox for a long time so we can all enjoy his work on a local level.